When working with a trading platform, we usually become accustomed to looking at charts in just one particular timeframe. Perhaps it’s the one that’s proven most profitable in the past. Or maybe it just happens to be the one on which the indicators seem to work best. Whatever the reason, this kind of approach can have its weaknesses. Looking at a market through the scope of a single timeframe is a bit like looking at a problem from a single dimension. What might look like a good trading opportunity at one scale, can look entirely different when viewed at a different time scale. This “single scale” approach also completely overlooks the complex realities of financial markets. Markets are influenced by real people with different investment motives and different time horizons. 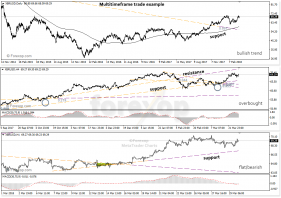 What is Multiple Timeframe Trading? Multiple timeframe trading means that you analyze the market in more than one timeframe. While most traders will glance at the chart above and below the current timeframe before placing a trade, often there isn’t any method to this approach. What multiple time frame trading does is bring the information from several different time periods into the decision, planning and execution phase. With most multiscale strategies, at least three different timeframes are deployed. Each of these has a distinct purpose. As an example, the highest period chart could be the daily chart. The middle would be the four hour chart, and the lowest the hourly chart. In multiple timeframe trading, technical analysts use what’s known as the wave analogy. The longest timeframe is called the tide, the middle timeframe is the wave, and the lowest time frame is the ripple. One motivation for multiple timeframe analysis is that it helps to resolve conflicting trading signals. This can be where one indicator is giving a buy signal yet another on a different scale is flagging a sell at the same time. In fact, both of these could well be right when applied to their respective time scales. The Fractal Market Hypothesis tells us that financial markets are not dominated by a single governing force. Rather the dynamics are a result of the money flows of distinct groups of investors with different time horizons. The fact that these participants have different objectives and therefore make use of different kinds of information means that each timeframe can, and should display a distinctly different picture. FMH theory says this is essential for the market to remain in a steady state. The upshot of this is that looking at a market in one timeframe, simply is not telling you the full picture. With a multiple time frame approach you can glean an insight into these money flows, and from that make more profitable trading decisions. Besides this, it can help to predict when relationships between different groups are breaking down and when the market is heading for a phase of instability. This following example uses three timeframes: The daily chart (D1), the 4-hour (H4) and 1-hour (H1) chart. The daily chart gives the strategic view. From this we determine the overall trend. The four hourly gives the tactical picture and allows us to look for profitable trades that are consistent with the strategic view. The hourly chart is for execution. Once a trading decision is made, the tactical chart is used to time the precise entry into the market. The daily chart shows a rising bullish trend on the 200-day moving average. The middle chart offers a different picture. Here the MACD indicator produces a sell signal. It is telling us that the market is overbought on this scale. The bottom, hourly period chart tells us something different again. This displays a flat to bearish trend. The MACD is in neutral territory, having past its last sell signal by some distance. What this tells us is that at this time we could have three very different outcomes, depending on the duration of our trade. Though a trade held for the long term could be profitable by riding the bullish trend, we’d expect to see some pullback in the short term. As well as differences, we can also use the charts to obtain confirmations. One main support line is the 200-day moving average, shown in the daily chart. We can also see this same support line is present in the lower two charts. The middle chart shows that there’s a resistance line just above the price around 70.0-71.5. This would affect the tactical decision on when to enter the market. A short term range trader might be happy to trade long up to the resistance line. A breakout trader might want to see that resistance line broken before entering long. As this example shows, a great deal of information can be gleaned by reviewing the market at different timeframes. The multi-timeframe approach attempts to pull all of these things together. 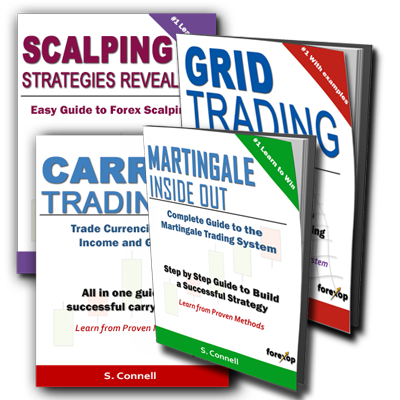 One of the best known multi-timeframe strategies is called the triple screen. The triple screen system was first described by Alexander Elder. The original triple screen uses a 5-up-5-down scaling although many who use it today apply different ratios such as 4-up-4 down. With a 5-up-5 down, the trader chooses a tactical chart – the daily chart for example. The strategic chart is then 5-times the tactical chart which would be the weekly chart. The lower timeframe would be the 4 hour chart, which is the nearest timeframe. 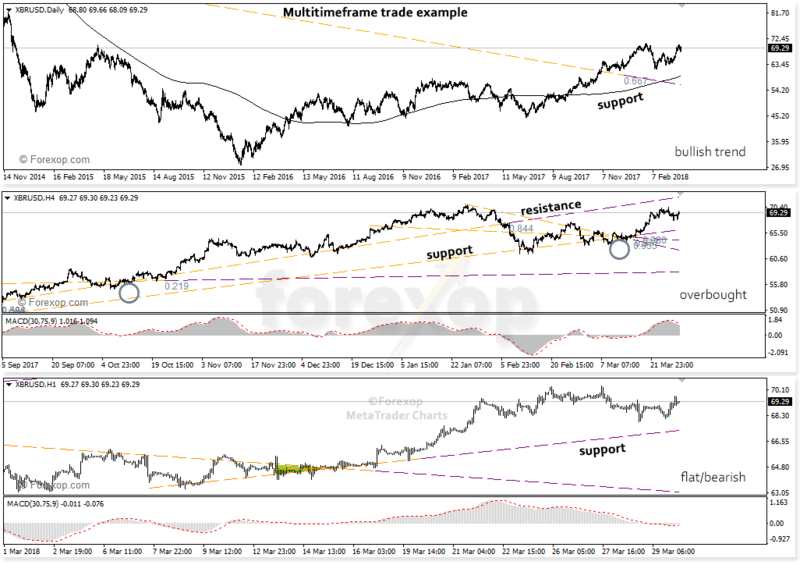 The multi-timeframe trade system has proven to be quite effective.